Oh my stars! I have been introduced to this wonderful little sweet treat that also just happens to be healthy and Paleo friendly. 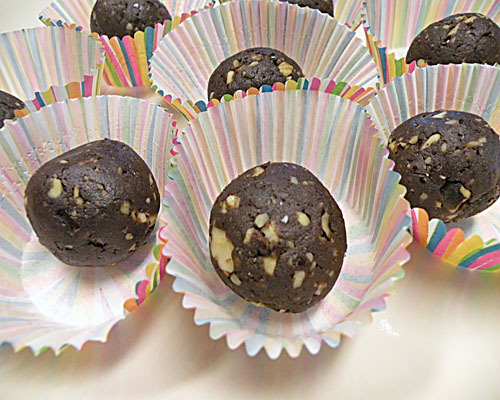 It has no flour or sugar involved and it tastes exactly like a moist, delicious fudge candy. You are simply not going to believe it. It is made with dates…. YES, that is correct, dates! Does it taste like dates? No, sir, not at all! It tastes like a wonderful chocolate treat that you can’t live without and like any chocolate treat it is highly addictive! So don’t say you haven’t been warned! These fudge babies have only a few simple ingredients, making them very easy to prepare and very, very, scrumptious! I hope you enjoy! Place all ingredients in a food processor and run until well combined. Form into balls or press into a baking dish and cut into squares. Makes 14 balls. My goodness! I looks really great and I could not tell it was dates at all – but then, I LIKE dates so that wouldn’t put me off like it may others, but that would be too bad for them because I bet this is fantastic! I love dates too! But for those who do not, you really can’t tell! Thanks! I love them too! If these were given to me by someone else I would never know! Thanks! They are very scrumptious! Thank you, Uru! I have all the ingredients to make this. I’m going to give it a try! You will be very pleased! Let me know what you think! Thank you! They are a must try! Thank you!